This product is a bundle (set of multiple products). This vanity set belongs to the elite series. This vanity set features a rectangle shape with a transitional style. This product is made for floor mount installation. DIY installation instructions are included in the box. This vanity set is designed for a 3h8-in. faucet and the faucet drilling location is on the center. Comes with an overflow for safety. This vanity set features 1 sink. This vanity set features 2 doors. This vanity set features 6 drawers. This vanity set is made with birch wood-veneer. 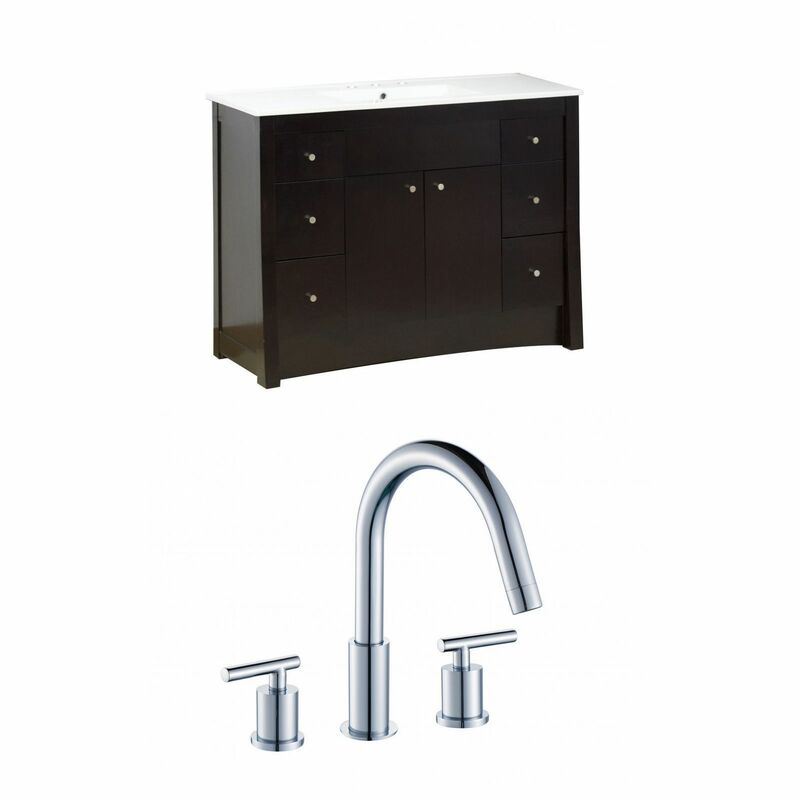 The primary color of this product is distressed antique walnut and it comes with chrome hardware. Constructed with lead-free brass, ensuring strength and durability. Solid bulky brass feel (not cheap and light). All mounting hardware and hot-cold waterlines are included. Max flow rate 1.8GPM. High-quality ceramic cartridge. Standard USA-Canada plumbing connections. Smooth non-porous surface; prevents from discoloration and fading. Double fired and glazed for durability and stain resistance. 1.75-in. standard USA-Canada drain opening. No MDF or chipboard used. Cabinet hardware included. Completely finished from all sides including back and inside. 48-in. Width (left to right). 18.5-in. Depth (back to front). 34.75-in. Height (top to bottom). All dimensions are nominal. This product can usually be shipped out in 1-5 day. Quality control approved in Canada. Your order is physically inspected before shipping. Lookout for the inspectors seal. 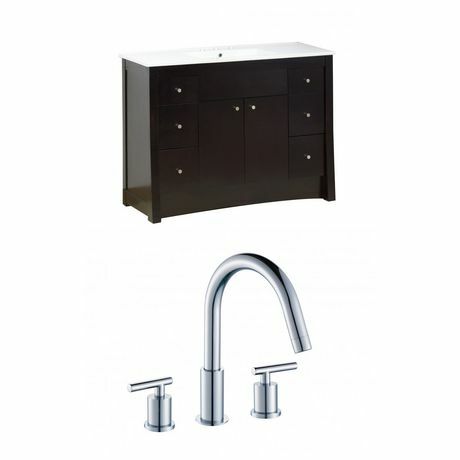 THIS PRODUCT INCLUDE(S): 1x bathroom faucet in chrome color (7911), 1x ceramic top in white color (422), 1x vanity base in distressed antique walnut color (1630).